In 2003, I attended a 7-weeks training on sustainable agriculture in Sweden. We stayed in Lund most of the time but we also saw Stockholm, Uppsala, other cities for several days. Very peaceful country, Cabinet Secretaries and legislators would go to malls and shops with zero security aides. 2017, things are different. many stories of riots, arson, looting, sexual assaults. Not in the entire country of course but in some parts of it. The usual NYT, always blame Trump for his comments or non-comments. 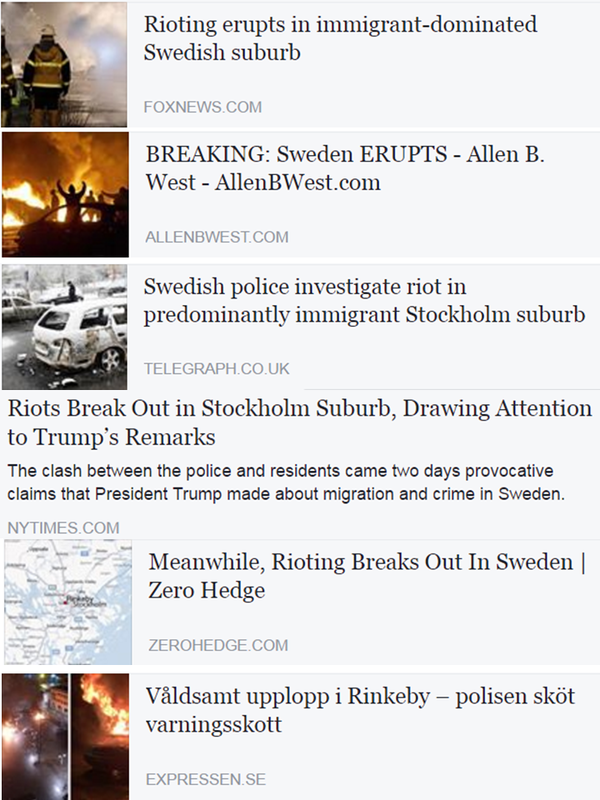 If rioters dislike Trump's comment about Sweden and the huge influx of immigrants from Syria, why not rally in front of the US embassy, why burn their neighbors' cars and loot shops and attack a journalist? I think it is the usual case of high expectation, high disappointment. 200k+ of migrants in 2015-2016 alone, many of these migrants expect the good life, expect high, generous welfare enjoyed by the locals be given to them too like free healthcare, free education to universities, free child support, etc. But government money does not come from the air or ocean, it comes from taxpayers and sale of govt-owned assets like land. There is a limit to the welfare system. The rioters who burned cars, looted shops and attacked the police, they don't understand that? They only believe that inequality is wrong as peddled by the UN and many central planners, so there should be forced equality for everyone? My proposal to help the huge volume of political immigrants and refugees is for rich countries to buy some islands in Europe or north Africa and relocate the migrants there. Give them immediate needs like food and housing, initial infra like roads and airports, initial peace keeping forces with time table for withrawal then leave the migrants to sort things on their own. What is important is they can escape massacres and pol persecution from their home countries.